I’ve been trying to write this post for a week. I wrote part of everything as a frothy public facebook post, but I wanted to line up my thoughts and put them down in a proper post for this. A thing for the ages. I am immensely proud of being part of Odyssey. I am happy with my contribution to the game in a way that transcends my usual armour-plated self-deprecation. As front-facing as I am, I get more credit than I deserve for the work of the entire team. Odyssey was a very opinionated game. Unapologetically gameist in design, with almost unbreachable class walls that dictated what skills you had and what areas of the game you could play. A hard-fought policy of never retconning player experience, rather changing our entire metaphysic to accommodate a screwup than undo the roleplay and stories around it. A written, understood metaphysic – in Powerpoint format as well – that we could reduce problems down to and attempt to keep consistency. The lack of any character advancement, the ability to entirely respec your character class between any events, the impermanence of death (and, later, the ability to bring your dead characters back into the story), and beyond everything the belief that whatever the players did, we should react to that and continue the story, not try and drag it back to what we were planning. I did none of that. I built some things on it, and I helped it appear in the field, but I did it standing on the shoulders of some giants of storytelling, of system design, of LARP theory. In Mimir (now Online for exploration and the code open for use or contribution) I built some systems to help it run more smoothly, and running the ref-desk to put a friendly if lightly sarcastic public face on interactions with the universe in general. Save a few screwups, I think I did fairly well. My natural tendency to over-analyse decisions I’ve made is countered by the fact that few people are actually complaining about any of them. I’ve heavy opinions about some of the things in Odyssey. There’s bits in the system I wouldn’t advise building on, there’s bits in the way the systems work backstage that I’d certainly recommend for the future, and somewhere there’s a long article about my opinions on running a ref-desk that I should finish. Plus, there’s the short article about using Excel to keep track of things in a live game. Don’t use Excel to keep track of things in a live game if more than one person needs to do so. But right now I’m finding it a bit hard to let go, to be honest. The idea that there’s no more left to do on it – I’ll update dagon.church with stats and more briefs, but there’s no actual writing left – is a little alien to me. Plus, there’s been a tornado of froth about the event, and about the system, on my social streams pretty much non-stop since the week before the event happened. I’ve got one more froth meet booked to attend – Thursday in Birmingham – but after that I think I’ll take some steps back. 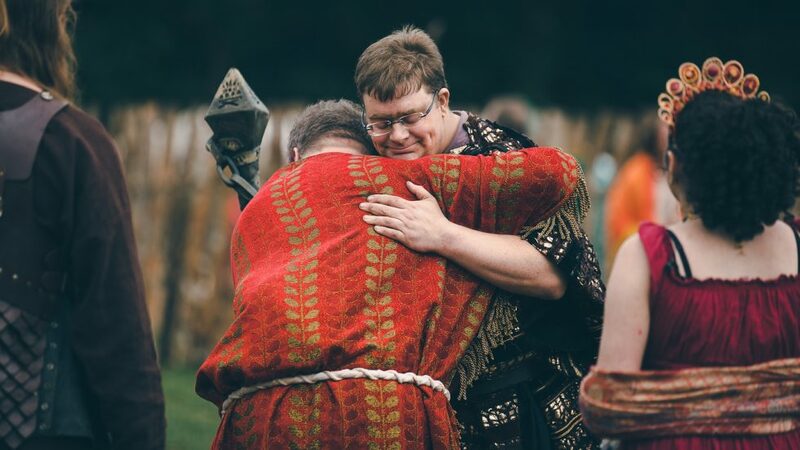 I’ve got between two and four LARP events left this year – Empire in a couple of weeks, Slayers after that, then maybe some Empire player-run events. I’ve got projects to pick up too. Larp.me could do with some attention, as could this site. I’ve got a couple of months if I want to rewrite NanoCountdown before November, and there’s this Trajectory system that’s looking more and more plausible to run. And a book to write. Onwards and awaywards, then. Time to put Odyssey to bed and move on with the next thing.